We shall now begin modeling the issuing of Purchase Orders (POs) by purchasers. We shall start with the display of a tabular list of requisitions approved by managers. This table will differ from previously modeled tables – we will specify which columns to display and in which order, instead of relying on defaults. An alert, displayed if any of the requisitions are marked as urgent, to prompt the purchaser to process them. A list of issued POs for the currently selected requisition. 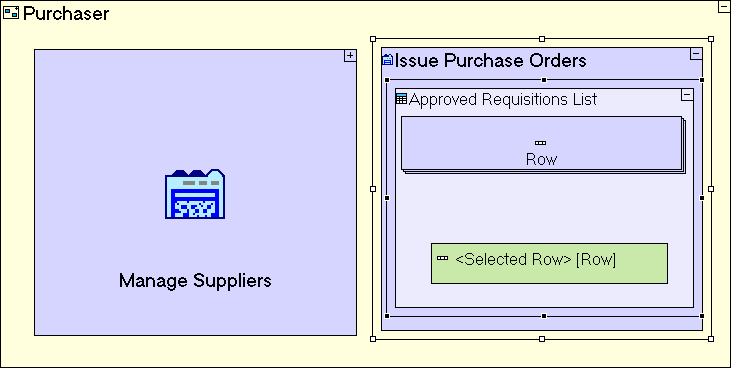 An Order button to issue a purchase order to a supplier for the currently selected requisition. After issuing a purchase order, the requisition is marked as (partially or fully) ordered. This stage’s modeling should be performed in the Tutorial 10-11 project, you imported at the end of the previous stage. Add Display/View. Name it Issue Purchase Orders. Zoom to Issue Purchase Orders. Add a Display/Table template ( ). Name it Approved Requisitions List. Zoom into it. The Table template comes pre-configured with a Row display element and a <Selected Row> display data element (of the Row) display, which will be used in subsequent steps to design and control the table display. Define the columns, by inserting Text/Number/Date Display templates into the row, each defining a cell in the row. Add a Display/Number Display ( ). Name it Id. Add a Display/Text Display ( ). Name it Description. Add a Display/Date Display ( ). Name it Date. Add a Display/Text Display ( ). Name it Urgency. The Number/Text/Date Display templates are similar to the Text Area input field we’ve previously used: each contains a <Value> element, which holds its value and serves as the source/target of flows which involve this value. The difference is in the user interface aspects of the two: An input field provides the user with the ability to change the value, whereas a display does not. The flexibility of using the Table template now comes into play. We control which fields from the database are displayed (Status in this case is not displayed), Also, we can explicitly define the order by which columns are displayed. Zoom out to Issue Purchase Orders view. Add a Basic/Action. Name it Populate Approved Requisitions List. 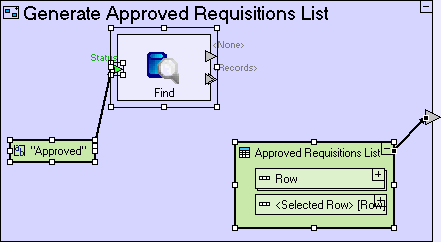 Zoom into Populate Approved Requisitions List. Add Basic/Action. Name it Generate Approved Requisitions List. Add an exit to it. Add an ancestor reference of the Issue Purchase Orders view. 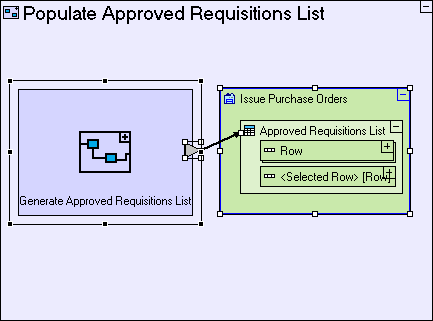 Create a flow linking the exit of Generate Approved Requisitions List to the Issue Purchase Orders/Approved Requisitions List table. Zoom into Generate Approved Requisitions List. Add a Database/Find. Add a trigger to it. Name the trigger Status. Reuse the “Approved” constant (used in Manager system/Requisition Approval view/Approve Requisition button). Create a flow linking it to Find/Status. Drag Approved Requisitions List table from the repository/outline. Create flow from it to the Generate Approved Requisitions List exit. Add a Basic/Action. Name it Convert Requisition Record to Row. Set it repetitive. Add a trigger and exit. Create a flow linking Find/<Records> to Convert Requisition Record to Row/Record. 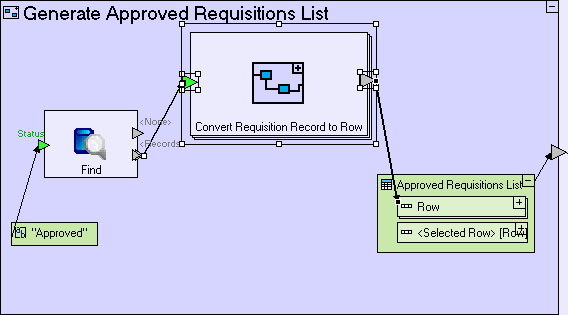 Create a flow linking the Convert Requisition Record to Row/Row exit to Approved Requisitions List/Row. Zoom into Convert Requisition Record to Row. Drag a Requisition databased record from the repository/outline (it's reused in various locations such as Open Requisitions view/Requisition List table). Create a flow linking the process trigger to it. 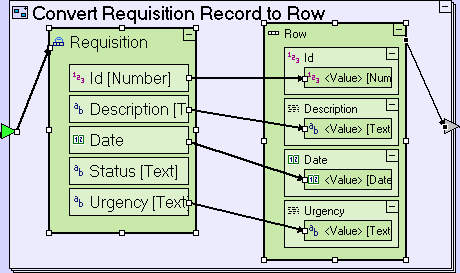 Drag a Row from the repository/outline (this is the row in Approved Requisitions List table). Create a flow linking it to the process exit. Switch to the Issue Purchase Orders view. Note that the requisition list displayed is different from previously modeled requisition lists, specifically the absence of the Status column. In the subsequent stages we will utilize additional features of the Table display, such as the ability to display computed values, and the ability to perform an action when a row is selected. Import the sample project Tutorial 11-12 and use it as the basis for the next stage of the tutorial. You may now proceed to Stage 12, in which we will learn how to perform actions conditionally.